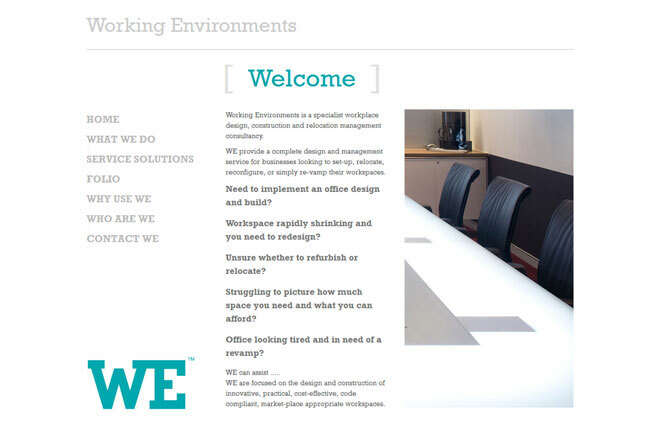 Working Environments is a specialist workplace design, construction and relocation management consultancy. The client for whom I had previously coded their design needed an update to brighten up their website and update the gallery for their folio of work. They also wanted to update their content to make it more relevant and not quite so wordy. I went for a minimalist layout with photographs on all pages to further highlight their work and installed a custom built Flash gallery for their folio. Very pleased with how the custom built animated main menu turned out; not too intrusive and synchronised with the company colour schemes used on the different pages of the site.